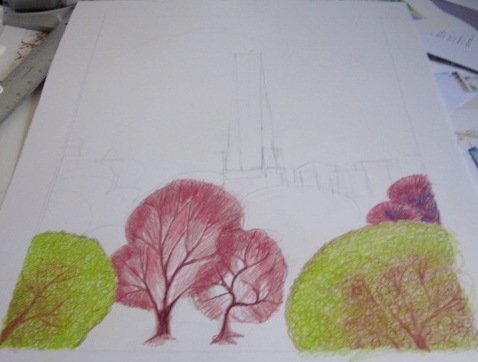 Here’s the stage where I am in doing the large version of “Freedom Tower”. As I usually find, when you translate something small into something much larger, you run into difficulties in detail and composition. Here I’m finding I need more trees to fill up the foreground. In reality, the foreground is actually a cemetery. I may include some headstones, as a tribute to those who died in 9/11. Still thinking about it.